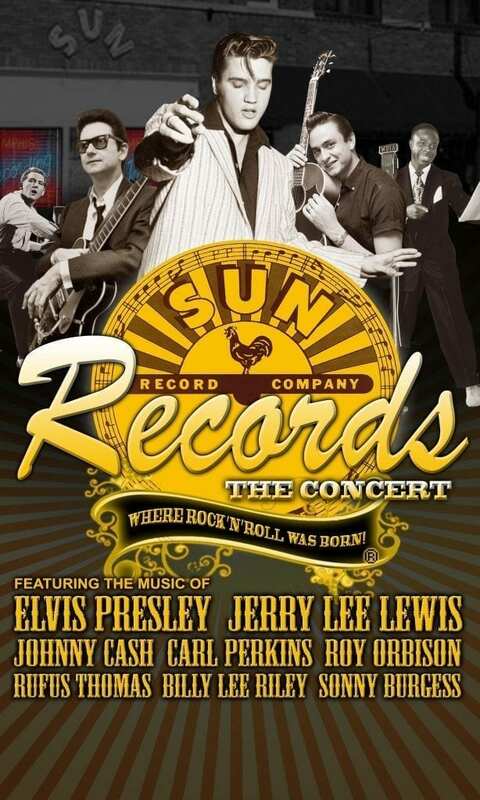 SUN RECORDS – Where Rock’n’Roll Was Born – the Official Sun Records Concert Show! The legendary record label that brought you Elvis Presley, Jerry Lee Lewis, Johnny Cash, Roy Orbison, Carl Perkins, Rufus Thomas and scores more rockin’ pioneers, comes to life live on stage. His trailblazing Memphis studio brought us That’s Alright Mama, Great Balls of Fire, I Walk the Line, Whole Lotta Shakin’, Bear Cat, Blue Suede Shoes, Good Rockin’ Tonight. . . hundreds of hits that would influence the world of music for generations to come. Sam Phillips was a patient, honest man and a perpetual optimist. In 1954 he combined a modest 19-year-old Elvis Presley with musicians Scotty Moore, Bill Black and then DJ Fontana to create music that infused country and r’n’b. Rehearsed in an exact replica of the Sun Studios, featuring the musical instruments of the era, starring a multi-talented cast of singers and a supporting cast of amazing musicians, the sound of Sun is brought to life live on stage in the official concert show that takes you back to the birthplace of rock’n’roll.